Sorry this event has now expired. But please check out other great events from the best of Bolton. 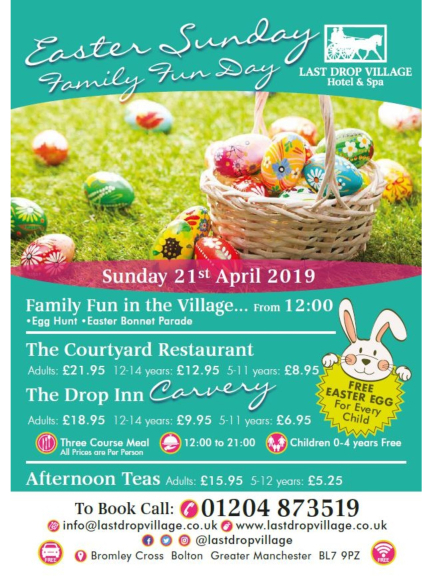 There is so much taking place at The Last Drop Village Hotel & Spa for Easter Sunday! Enjoy fantastic fun in the village with an Easter Bonnet parade and Easter Egg hunt from 12pm! The Courtyard Restaurant - Only £21.95 per adult, £12.95 for children aged 12-14 and £8.95 for children aged 5-11. The Drop Inn Carvery - Only £18.95 per adult, £9.95 for children aged 12-14 and £6.95 for children aged 5-11. Please note in both restaurants, the price includes a 3 course meal, and children aged 0-4 eat for free. All children will receive a FREE Easter Egg. Not only that, if you fancy a delicious afternoon tea, this is also available on Easter Sunday for £15.95 per adult and £5.25 for children aged 5-12. To book, please call The Last Drop on 01204 873519!